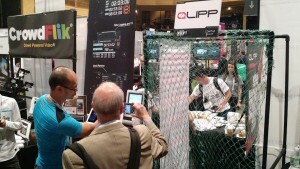 After months of preparation, QLIPP was finally at Startup Alley for Disrupt New York 2015 organized by TechCrunch! 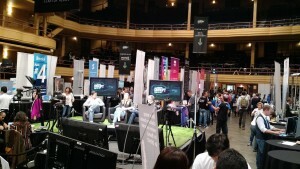 Held at Manhattan Centre from 4 to 6 May, this event featured hundreds of entrepreneurs from all over the world. We are honored to be a part of Disrupt New York 2015, which is said to have one of the best lineups yet. Since 2012, TechCrunch Disrupt has been one of the most successful platform for creating exposure and propelling the growth of numerous startups and is also one of the most anticipated tech conferences globally. 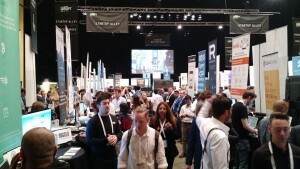 TechCrunch Disrupt has been rapidly gaining attention from the media, investors and renowned industry figures due to the substantial amount of potential displayed by the startups each year. After an exciting first day at the event, we were able to set up our booth and demonstrate the use of our QLIPP Ultimate Tennis Performance Sensor to the media and esteemed industry experts on the second day. The attendees of the event were able to experience firsthand how QLIPP works, through an interactive hands-on session right there at Startup Alley. By simulating the actual experience of playing tennis, we were able to demonstrate how the sensor is able to accurately provide real time feedback on the player’s performance. The accuracy of our sensor in measuring data such as the types of stroke, swing speed and sweet spot accuracy was well received by the attendees of the event. 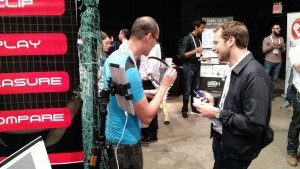 Many were impressed by the ease of use of the sensor with its unique ‘twist and lock’ design as well the speed in which feedback could be obtained. Through Disrupt NY 2015, we were able to receive valuable coverage from the media figures present and it is our privilege to also be recognized as one of the Top 11 Startups of Day 2 at Disrupt NY 2015 by Upstarted. For more updates on QLIPP, be sure to follow our Facebook page! Next → Next post: QLIPP NOMINATED FOR GERMAN DESIGN AWARD 2016!